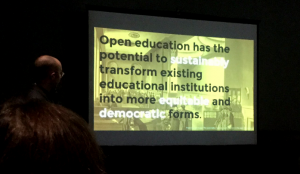 At my institution, we’ve been talking more about open education in the past year. Open access has long been on our agenda, but open education is such a large umbrella. We’ve begun to bring other open education-related work to the fore. As open education efforts on our campus continue, my colleagues and I are planning to launch a small grant initiative to help build momentum. We are imagining these stipends as a way to support faculty/instructors interested in adopting, adapting, and creating OER for their courses. We are also excited about the pedagogical possibilities that OER work might offer, so I’m particularly enthusiastic about the option we’re including to support the development of assignments in which students collaborate in the OER work of the course. We’re developing the application guidelines and evaluation criteria for this grant initiative now. A few searches easily turn up helpful examples of such initiatives at a range of institution types: American University, Bucknell University, College of William & Mary, Davidson College, Old Dominion University, University of Kansas, and Utah State University, to name a few. These have been helpful in informing how we’re shaping and framing our application and outreach process. But I’m particularly eager to hear reflections on the successes, challenges, and outcomes of the work from those who have already taken a lap around this track. I recently revisited Sarah Crissinger’s thoughtful and helpful reflections on her OER work with faculty (part 1, part 2, part 3). Yet I’m eager for more and find myself wondering about your thoughts. I expect many of you have experience administering OER-related initiatives with similar goals. If so, how have you framed your program? What have you found to be important to your success? What barriers have you encountered? Or perhaps you are someone who has participated in this kind of initiative (or would like to). If so, what kinds of guidelines or support were (or would be) most useful? I would love to hear about your experiences and thoughts in the comments. This week it was reported that Berlin-based ResearchGate, a social networking site designed for scientists to share research, received $52.6m in investment funds from a variety of sources, including BIll Gates (previous investor), Goldman Sachs, and The Wellcome Trust. This news is another development in a continuing saga and conversation surrounding commercial services (i.e., ResearchGate, Academia.edu, Mendeley) and the companies that own them, managing the scholarly profiles and content of researchers. While ResearchGate promotes a mission of connecting “the world of science and make research open to all,” open access advocates and those working in scholarly communications are quick to point out that these platforms are not open access repositories. Much like we shouldn’t rely on Instagram to serve as our personal digital photo repository, researchers and academics shouldn’t rely on these commercial platforms for long term preservation of and access to their content. Hence, the work of open access institutional and disciplinary repositories takes on a certain imperative in the scholarly sphere. Those at Humanities Commons recognized this need, and in 2015 launched CORE, the Commons Open Repository Exchange, originally a digital repository for MLA members to share and archive “all forms of scholarly communication, from conference papers to syllabi, published articles to data sets,” now open to anyone who joins Humanities Commons. I spoke with Nicky Agate, Head of Digital Initiatives in the Office of Scholarly Communication at the Modern Language Association to discuss CORE, in light of national attention garnered in a recent Forbes article about the monetization of scholarly writing. Virginians involved in education were extremely fortunate to have the 13th Annual Open Education Conference held in Richmond, at the Great Richmond Convention Center November 2nd through 4th, 2016. The conference, billed as the “premiere venue for sharing research, development, advocacy, design, and other work relating the open education,” offers librarians a unique opportunity to interface with researchers, technologists, publishers, and educators in a collaborative environment. While some of these connections happened during sessions on topics like inclusive design, open education policy, and licensing, many occurred between sessions. On the final day, I had the chance to eat lunch with several William & Mary faculty and student researchers interested in open education, along with Kathleen DeLaurenti, the librarian at William & Mary leading our OER initiatives. The lunch conversation afforded me great perspective on the challenges educators face when trying to access and utilize appropriate open education resources as alternatives in their classes, especially for advanced topic courses. I am excited to join deLaurenti and our Scholarly Communications Committee’s efforts to expand open education resources here at William & Mary, where we will be running a pilot of the Open Textbook Network Program beginning early next year. Open education is not just about textbooks and materials, however. Among the presenters at the Open Ed Conference this year was a William & Mary Ph.D. student in the School of Education, Jamison Miller, who joins a growing contingent of open education scholars calling for a theoretical grounding to support the practicum, resource-focused open education movement, a component he feels will be critical to its long term success and sustainability. Is Open Access Enough? Strategies for Healthier OA. I’m a salesman, and the hardest part of my job is encouraging people to buy. As a Digital Scholarship librarian I manage the Institutional Repository (IR) and peddle Open Access (OA) to students and faculty, who, despite enthusiasm in our field are sometimes skeptical about web based and OA resources. For a long time, librarians have championed OA in the light of the greater good that access will provide. We very often cite the evidence that OA increases impact factor and citation counts for our faculty, while librarians like Char Booth show the ways in which OA empowers students to publish and contribute to larger scholarly conversations. Unfortunately, in the recent past we’ve seen high profile rejections of the OA model. The most notable of these is the American Historical Association’s recommendation against OA deposit of History Theses and Dissertations. This has been debated and framed as “protecting the most vulnerable” in the academic profession. Inherent in this is a distrust of the open access model as a legitimate form of scholarship (despite arguments to the contrary). Anecdotally, I hear stories of faculty discouraged from publishing open access because of the lesser prestige associated with these journals. Low faculty involvement in the Institutional Repository and suspicion of OA are symptoms of growing concerns surrounding the intellectual weight of OA resources. There are some in our universities who will see Char Booth’s assertion that OA is good pedagogically for students, as evidence to this point that OA journals and publishers do not have the weight that traditional “brick and mortar” journals have (ie it is good enough for students but not good enough for faculty.) For a long time I have explained the importance of OA to my faculty as a discoverability and impact issue, but, evidence has shown it is a quality issue as well. Just because availability of research increases its use, most often through FUTON (Full Text Online) bias, this is not indicative of the caliber of a resource. Therefore, Librarians shouldn’t dismiss our faculty’s concerns as a stodginess or an unwillingness to publish in web sources, but instead view them as part and parcel of larger debates of what makes research influential, impactful, and important. I have seen this in my limited experience as a new librarian at both my graduate school and my current institution. Predatory journals and publishers work to capitalize on our enthusiasm for OA to entice our libraries to purchase, and our faculty to publish in, less than reputable journals. This is where our enthusiasm hurts the people we’re here to help, and hurts the overall image of OA. That is why I believe that librarians should encourage more than just openness in publishing; we should encourage quality. These are not mutually exclusive. A result, perhaps, of the glut of false information on the internet we are suspicious of the quality of online sources. Open sources because of their very nature exist outside of the familiar boundaries of the expensive and locked journals of yesteryear, and so they are presumed to lack intellectual weight. How do we as librarians combat this in our efforts to encourage OA? For libraries with OA funds, we should only fund journals that appear in the Directory of Open Access Journals (DOAJ) and we should investigate every publisher who appears on the market. We should become well-versed in resources like Beall’s List that show predatory publishers, and we should warn each other about new and shady publishers. These sources are not set in stone so we should be open to talk with publishers about what we desire from open access publishing. We should hold our own hosted journals and monograph series to the same standard that our University Press partners and influential journals do. By doing this we do not limit who can publish or what can be published, but we ensure that OA journals and repositories will be treated with the respect that we know they should. The result would be that all open research including student research (which is often seen as unpolished or unready for the limelight) will be more impactful because of the healthier state of Open Access. We are approaching a moment where open publishing could be as accepted, especially for tenure files, as established sources. Alas, all of this open information is useless if no one is reading it. We should make it a point to include OA resources into our database instruction. Why isn’t the Institutional Repository taught in our class sessions as a resource for students to use? Why do we always point to our paid databases rather than OA ones? There are two common sense reasons for this, one being that we pay for these resources, and two that these resources are “legitimate,” as in they are peer-reviewed and, often, backed by universities or organizations. Open Access in some ways counteracts the elitist undertones of this kind of thought. But this is a self-fulfilling prophecy. Open resources are not seen as legitimate because we do not treat them as such, and legitimate resources do not use them because we do not believe them worthy. As Daniel Dorner and James Revell remarked in 2012, about IRs and OA, they: “must also be seen by information seekers as an accessible information resource whose content is useful to their needs”1 This worthiness is built not on availability but on expectations of quality. Hence, increasing the use of the IR or of OA resources will show that they are a worthy home for higher quality projects. If we expect people to submit to OA sources, we should encourage them to use the materials that are already housed in them. Author Dylan BurnsPosted on November 12, 2016 November 16, 2016 Categories Open Access, Open EducationTags Open Access, publishing, Scholarly CommunicationLeave a comment on Is Open Access Enough? Strategies for Healthier OA.